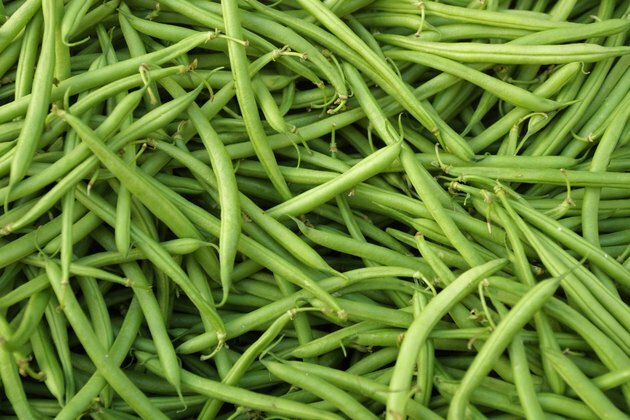 Also referred to as green beans, runner beans, string beans and wax beans, French beans are typically around 4 inches long and feature a bright green color. When the beans are sliced open, tiny seeds can be found inside. But don't worry about removing these seeds before cooking — they are edible and nutritious. French beans are high in fiber, protein, iron, calcium and a variety of other vitamins and minerals. Avoid boiling French beans, as much of their healthy nutrients seep into the water. Instead, opt for steaming the beans or sautéing them in a bit of heart-healthy olive oil. Pile the whole beans into a large colander. Rinse thoroughly with cool water to remove any dirt or residue. Continue rinsing until the water runs clear. Cut off the ends with a sharp knife. To maintain a sweet taste and crisp texture, trim the beans as little as possible. Slice the beans lengthwise from one end to the other; this creates a French-cut bean. Pour the beans into a steamer basket and set the basket into a large saucepan. Add 1 to 2 inches of water to the bottom of the saucepan and allow the water to boil. Once boiling, cover the pan. Steam the French beans for five to seven minutes or until crisp and tender. Remove the steamer basket from the saucepan and plunge the basket and beans immediately into ice-cold water to stop the cooking process. Leave the beans in the water for just a few seconds before removing to your serving dish. Season the beans as desired. For a simple dish, you might use just butter, salt and pepper. For something a bit more savory, consider adding dill, garlic, cumin or red pepper flakes. Steam the French beans using the same process described above. This time, however, only steam them for two or three minutes before removing them from the steamer basket. Heat 1 tbsp. of olive oil in a skillet over medium heat. Stir the green beans into the heated oil. Add additional seasonings or ingredients as desired. Ideas include onions, bell peppers, mushrooms or small pieces of bacon. Saute the French beans and additional ingredients in the olive oil over low-medium heat for 10 to 12 minutes. Stir every few minutes to avoid burning or sticking.